My fifth book for the R.I.P. X challenge is Lolly Willowes by Sylvia Townsend Warner. 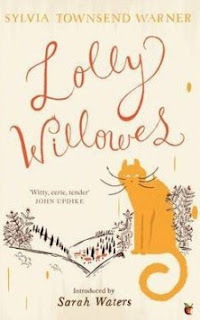 Laura, known as 'Lolly', Willowes is a young woman utterly devoted to her father. Unmarried with two older brothers to whom she is not particularly close, Laura and her father have been inseparable since the death of her mother. When he too suddenly dies it is decided for her that she should go to live with her older brother, Henry, and his wife and two children in London. Laura acquiesces without too much of a fight though she's not sure if it's what she really wants. For the next twenty years Laura's life is that of the maiden dependent aunt. Her brother's family are not unkind but they take for granted that she will be an unpaid child minder and housekeeper. She adapts to London life quite well even though her preferance is very much for a quiet life in the country. But there is no returning to that as her other brother, James, and his wife now inhabit her childhood home. Then one day Laura stops to buy some chrysanthemums in a florist shop. Questioning the shop owner she discovers the flowers have been grown in the Chiltern hills in Buckinghamshire. Straightaway she visits a bookshop and picks up a guidebook to the county. She studies it carefully and decides to leave her brother's house to go and live in a village she likes the sound of, Great Mop. There is some resistance to her plan, naturally, but Laura is determined and takes up lodgings with a Mrs. Leak. The village is an odd one. It is undoubtedly very beautiful and exceedlingly peaceful, set amongst rolling hills and wooded valleys. But the people are not terribly friendly... nor are they precisely hostile... they're just rather indifferent. They go about their business and that business never includes Laura. Which suits Laura down to the ground because, after twenty years of being at everyone's beck and call, what she really wants is to be quiet, alone, to go unnoticed. And so it goes for quite a while until her nephew, Titus, announces that he plans to write a book and in order to do so is going to come and live with Laura in Great Mop. Laura's rural idyll is shattered. Titus is popular in the village, a 'character'. He likes to acompany her on her walks and gets her to help with writing up his book and so on. Laura is once again at the mercy of 'family'. What can she do to solve this problem? This might not seem like an obvious choice for the RIP challenge but the last third of the book proves that it very much is, albeit in a much more subtle, satirical manner than your more obvious 'in your face' horror story. The countryside is the star of the show here, and what may or may not go on in the woods and fields that ordinary mortals have no knowledge of. It reminded me strongly of supernatural stories Algernon Blackwood wrote about the Canadian backwoods, all beautiful descriptions of wooded valleys but with an underlying sense of the mystical and unknown. Very clever. Of course reality is never far away. Laura knows this because she's had to live the 'real' life of a dependant relative for twenty years and can never quite get rid of the feeling that it will catch up with her eventually, which of course it does. It's not that her family are cruel, in fact quite the reverse, the problem is that Laura's life is not her own. She's living it according to her family's expectations of what a maiden aunt should be. It was an extremely common story just after World War One when this story was set. So many men were killed that there was a surplas of single women, and for women of Laura's class a career, 'earning your own living', was out of the question. You went to live with relatives and said relatives thought that you ought to think yourself lucky. I thoroughly enjoyed reading a tale of a woman who decides to break the mould and in such an unusual way to boot. In my library book copy the introduction is written by author, Sarah Waters. I read that after I'd finished the book, as I often do, and found that an interesting and informative read. Sylvia Townsend Warner was clearly a fascinating woman, breaking the mould herself by living with a female partner for forty years until her partner's death. Not only would I like to read more of the author's fiction, I'd also like to read more about her life... I believe there are diaries available and so forth. Always a good thing to discover yet another reading tangent to go off on: you just never know where it will lead in my experience. A couple of titles for this year's R.I.P challenge today. 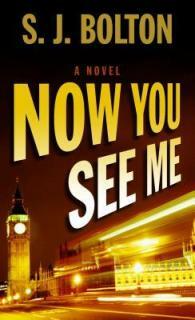 First up is Now You See Me by S.J. Bolton, my third book for the challenge. London policewoman, DC Lacey Flint, is returning to her car one night after an interview with a potential witness. Leaning against her car is a woman who's been brutally stabbed: Lacey is unable to save her and she dies. She finds herself working closely with the Major Investigation Team who're called in to investigate the murder. Her new colleagues are not all to Lacey's liking, especially as it seems one of the men suspects Lacey of the killing. It's not long before a connection is made between the murder and Jack the Ripper's first murder, date, circumstances and so on. Lacey being an expert on the Victorian serial killer finds herself even more to the fore in the investigation. When another body is found brutally murdered on the anniversary of the second Ripper killing it's quite clear they have a copy-cat serial murderer on their hands. How can Lacey help catch the killer and still keep hidden the secrets she's harboured for many years? I probably wouldn't have picked this up off my own bat but Margaret at Booksplease has been recommending the series lately and my curiosity was piqued. And I'm really glad as this was a cracking read. *Not*, I should add, for the faint-hearted as it pulls no punches when it comes to describing the mutilated bodies. If you can cope with that and enjoy trying to unravel a complicated plot and guess a main character's secrets then the series is well worth a try. The tie-in with Jack the Ripper worked very well for me, loads of interesting info such as the fact that the original murders spawned many copy-cat killings and police had a really tough time deciding which ones were 'canonical' murders and which were not. Plus, journalists and police added to the confusion by making 'facts' up so no one really had any idea *what* was going on. No wonder they never caught him. There's also a fascinating theory on who the murderer was in Now You See Me. Worth reading just for that. I shall definitely grab book 2 from the library and hope to read the 4 (or is it 5... Fantastic Fiction has 4 listed and an unnumbered one underneath?) books that have been written so far. My fourth book for this year's R.I.P challenge is The Saint Germain Chronicles by Chelsea Quinn Yarbro. 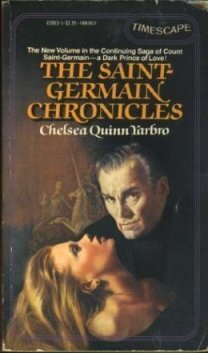 This short story book comprises five short stories involving Chelsea Quinn Yarbro's vampire hero, The Compte de St. Germain. I'll just go briefly through each one. 1. The Spider Glass. This is a story told around the fire with six guests attending and listening, set in Edwardian times. The narrator is an English aristocrat and he's retelling the story of what happened to one of his female ancestors in the 17th. century. Her and her son were left abandoned in Paris with no way of fending for themselves. She was so desperate she tried to rob a stranger who turned out to be the vampire, The Compte de St. Germain. The story describes how she became suspicious of his lifestyle and what she did about it. This was not a bad story actually. Told in the tradition of English ghost or weird tales... around the fire with some fascinated listeners. The end was no surprise but I enjoyed it nevertheless. 2. Renewal. James, a war correspondant, has been involved in a motor accident in France in the middle of WW2. The other passengers are all killed and James wanders off and heads for the house where he and his lover, Madelaine, were so happy, hoping to find her there. She's away and instead he finds an enigmatic count there - St. Germain. Interesting little story. You're drip fed information but again the outcome is not a surprise to anyone who reads a lot of this kind of thing. 3. Art Songs. A short little story that takes place in a concert hall. It underlines the deeply loving relationship between St. Germain and Madelaine and introduces the idea that the vampire will have move to America to avoid being investigated for his business holdings and strange lifestyle. 4. Seat Partner. St. Germain sits next to a young woman on the plane to the USA. She tells him about her life. He deduces that she's living her life as others want her to rather than as she wants. Interesting little vignette. 5. Cabin 33 St. Germain and his companion come manservant, Roger, are now living in the USA and running a log cabin holiday business in the Rocky mountains. But something is the matter with one of his young guests. She seems listless to the point of illness and her parents don't seem in control of the situation. Someone needs to investigate and it falls to St. Germain to be the one. The stories are also interspersed with letters the vampire sends to various people in the stories and at the end there's an essay by the author about The Compte de Saint Germain. Twenty five years ago I would have adored this book. I'd just discovered the St. Germain series after finding Cabin 33 in an anthology of vampire stories. I subsequently managed to find the first three books in secondhand bookshops here in the UK... American books published in the days before the internet... nothing short of a miracle really. I adored them all... and wanted this short story volume more than I can say but couldn't find it anywhere. My 21st. 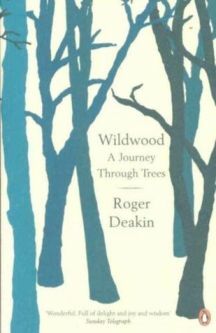 book for the Mount TBR 2015 challenge is Wildwood: A Journey Through Trees by Roger Deakin. The trouble with taking months to read a book is that by the time you get to the end you've forgotten what you read at the beginning. (And it doesn't help that I haven't the first idea how to go about reviewing a book like this either.) I'm not at all sure when I actually started this non-fiction book, possibly as far back as May or June, I know I abandoned it for a couple of months as I felt I wasn't really connecting with it. Anyway, I decided to pick it up again a couple of weeks ago because having got over a third of the way through it seemed a shame to give up on it. 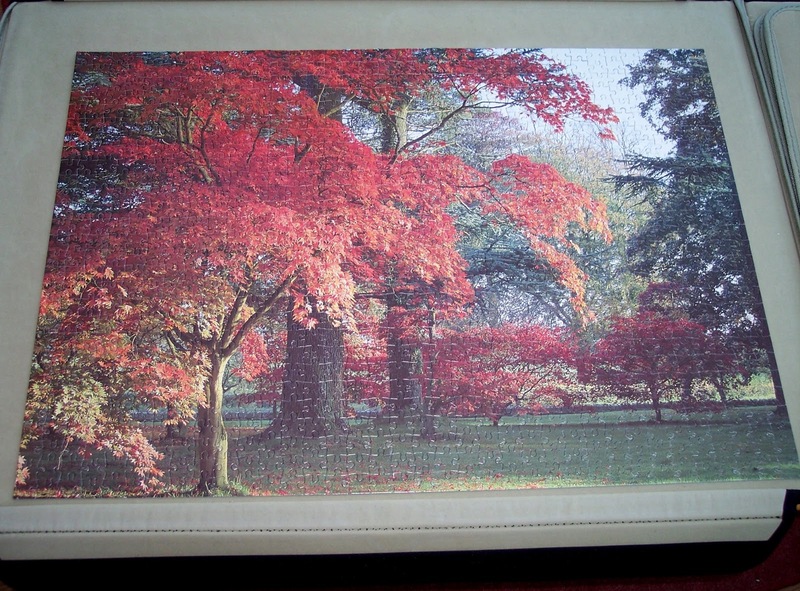 The book is basically a celebration of trees... woodlands, forests and single trees; the fruits of those forests, the people who use them, what they do with the wood or fruit, how they make a living and so on. The author spent a lot of time camping out in woodlands, or on his own land where he had an old caravan affair he would spend summer nights in. The writing is rather beautiful and it was interesting reading about his experiences living out in the natural world and the wildlife he encounters. There are also several chapters on his childhood. He attended an independent school where an inspirational teacher took classes of boys camping in the New Forest to study everything about a small area of woodland. They kept valuable records of the flora and fauna and a generation of boys were inspired to take an interest in the natural sciences. Deakin covers quite a few areas of the country for the book: The Forest of Dean, parts of Devon, Essex, Hampshire, Suffolk, where he lived. We learn about moths, rookeries, bluebell woods, collecing driftwood on the coast and much, much more. I rather thought that this was a book entirely about the British countryside until I turned a page and suddenly the author was walking in the Pyrenees. Huh? All of a sudden it became an overseas travelogue. I was not expecting that. After the Pyrenees he moved on to The Carpathian mountains to walk through forests with a friend who was retracing her father's footsteps as he ran from the Nazis in WW2. Then Deakin is off to Kazakhstan to look for the origins of the apple amongst the wild apple woods of the Tien Shan Mountains. From there he travels to southern Kyrgyzstan to learn about the walnut forests from the people who spend months each year camping there, harvesting the nuts. He met and stayed with local families and learnt about a way of life very few people know about in the west. I certainly had no idea that a large proportion of the world's walnut crop is grown in Kyrgyzstan. I wasn't even quite sure where it was to be honest - it's in Central Asia and has borders with China, Kazakhstan, Uzbekistan and Tajikistan, capital city, Bishkek. I love having my knowledge of the world enhanced by reading books such as this. Personally, although I quite enjoyed the the beginning sections of the book that dealt mainly with the British countryside, the book really took off when he went travelling overseas. That's just me though. I'm very much into mountainous locations and loved hearing more about places I'd read about in Clear Waters Rising by Nicholas Crane. 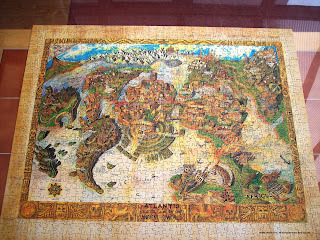 But also the completely new regions - to me - of Kazakhstan and Kyrgyzstan and the mountains and forests that exist there. Doesn't seem five minutes since I began the year intending to climb Mount Blanc by reading 24 books for Bev's Mount TBR 2015. Now here we are three quarters of the way through the year and it's time for check point number 3 already! 1. Tell us how many miles you've made it up your mountain (# of books read). If you're really ambitious, you can do some intricate math and figure out how the number of books you've read correlates to actual miles up Pike's Peak, Mt. Ararat, etc. B. Pair up two of your reads using whatever connection you want to make. Written by the same author? Same genre? Same color cover? Both have a main character named Clarissa? Tell us the books and what makes them a pair. So, I'm going to do 'B'. And the book I'm just finishing, Wildwood: A Journey Through Trees by Roger Deakin. The reason I'm pairing these two up came as a surprise to me. A pleasant surprise. 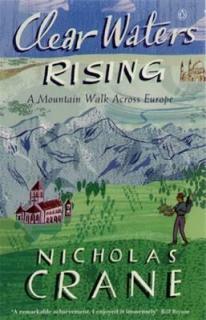 One of my reading interests is 'mountains' and in Clear waters Rising the author, Nicholas Crane, walks across Europe via a continuous line of different mountain ranges. Excellent. Loved it. When I started Wildwood I never imagined there would a connection as it seemed to be all about woods in The British Isles. Well not quite. Halfway through the book he's suddenly in the Pyrenees and I'm transported right back to March and Crane's trek through that beautiful mountain range. Both men loved the people and the scenery. A few chapters on and Deakin is in The Carpathians, a range in Eastern Europe - The Ukraine, Poland etc - just like Nicholas Crane later in his book. This range seems a very different kettle of fish somehow. More challenging, the area politically sensitive, its people not necessarily friendly. The reader can feel that the two authors are a lot less comfortable here, uneasy, life is harder and thus walking for tourists is too. It was fascinating to be honest. I really love coming across these coincidences in books so this fits my answer to this question perfectly. I found this one in a charity shop and it is a real place... I found out where it was in the summer but have now forgotten again. 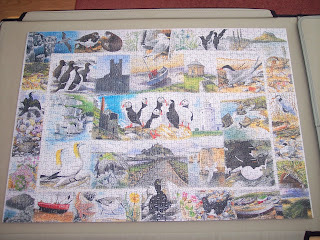 The puzzle had really odd shapped pieces which I always enjoy in a puzzle. 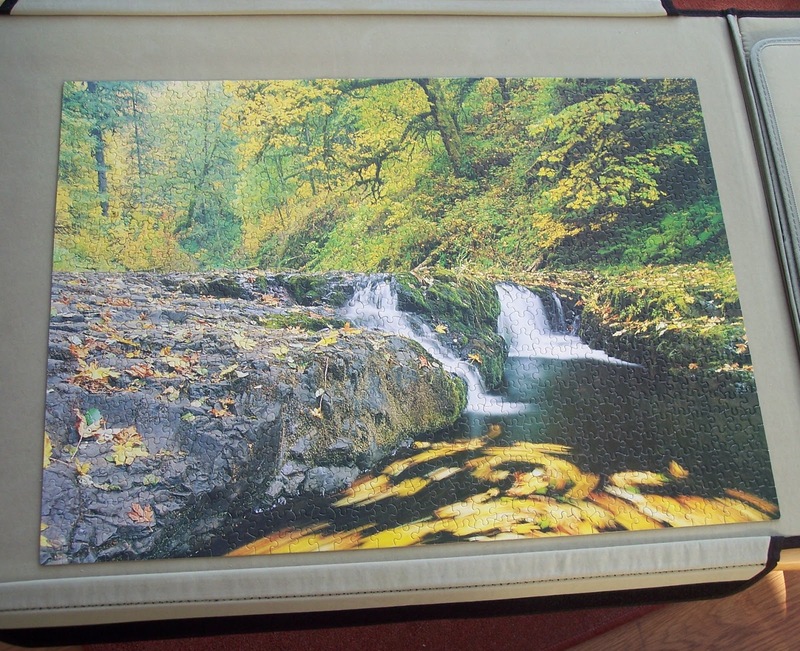 This is an American puzzle. I can't remember whether my daughter found this in a local library where they have a jigsaw lending section or whether I found it in a charity shop. 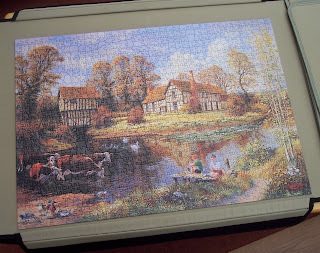 Whatever, it's always a pleasure to get to do puzzles from across the pond. I believe this is a scene from a NP in Oregon or Washington state. 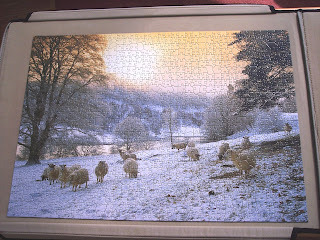 Another charity shop find, this time the scene is Scottish, Perthshire if I recall. I always grab any snowscenes I find. 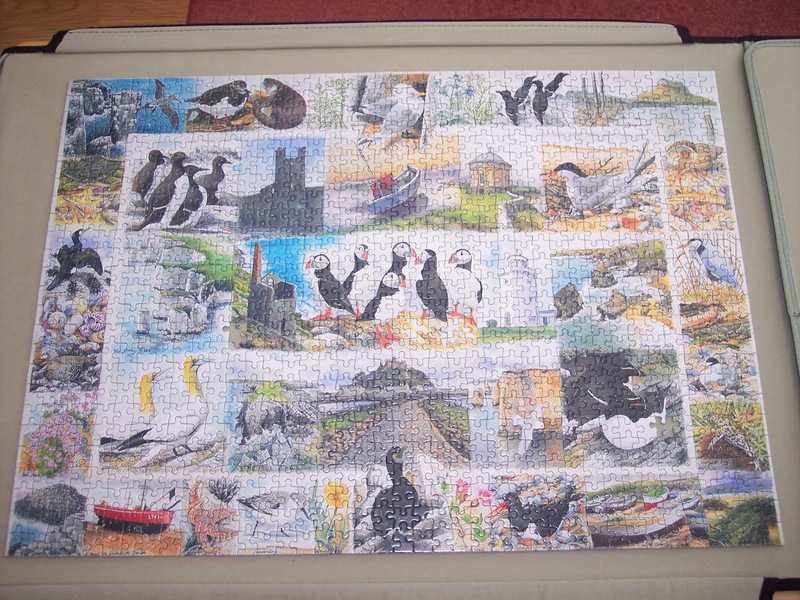 Loved doing this one, all the different scenes of seabirds, beach scenes and National Trust properties really appealed and it was like doing dozens of seperate little puzzles. 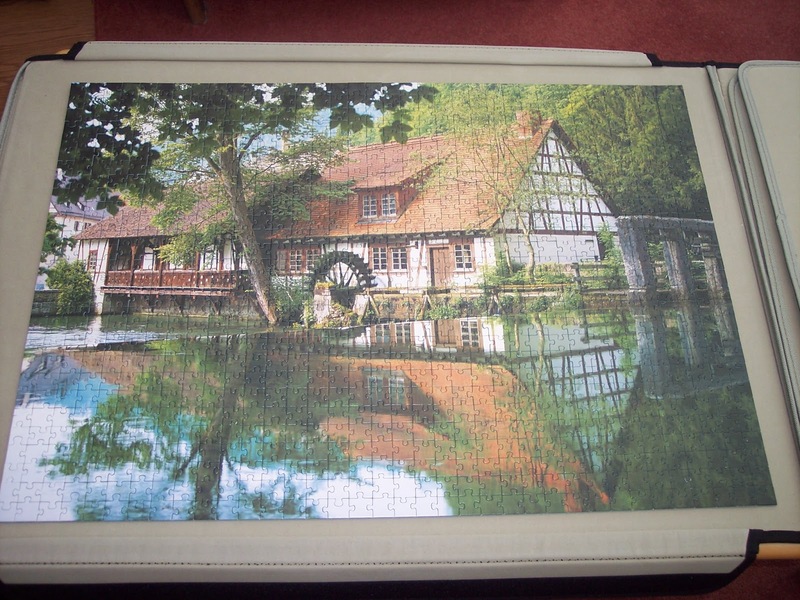 This is a German puzzle (Ravensburger) so this maybe a German mill scene. Not sure. But I always enjoy doing reflections in puzzles so grabbed this one quick from a charity shop. 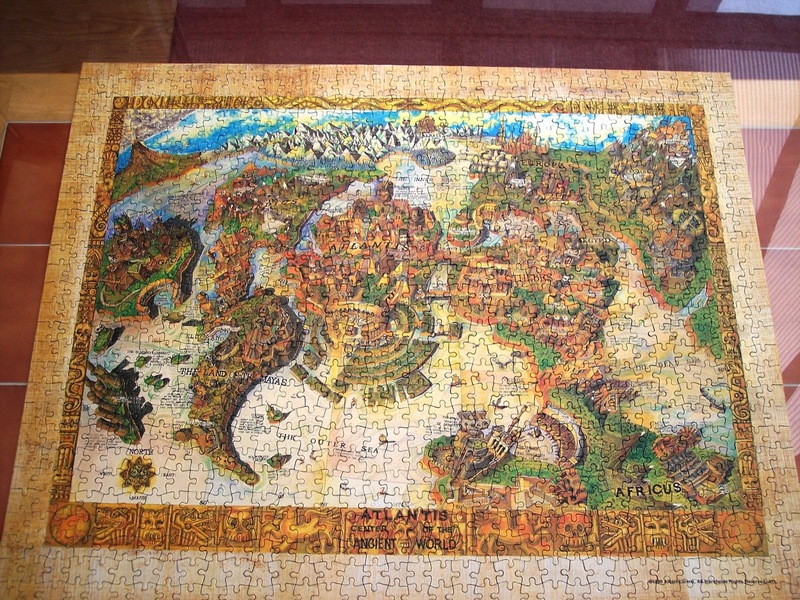 Thrilled to find this American fantasy/folklore/history style puzzle in a charity shop! Just my kind of thing and really expensive on Amazon. Huge fun to do. 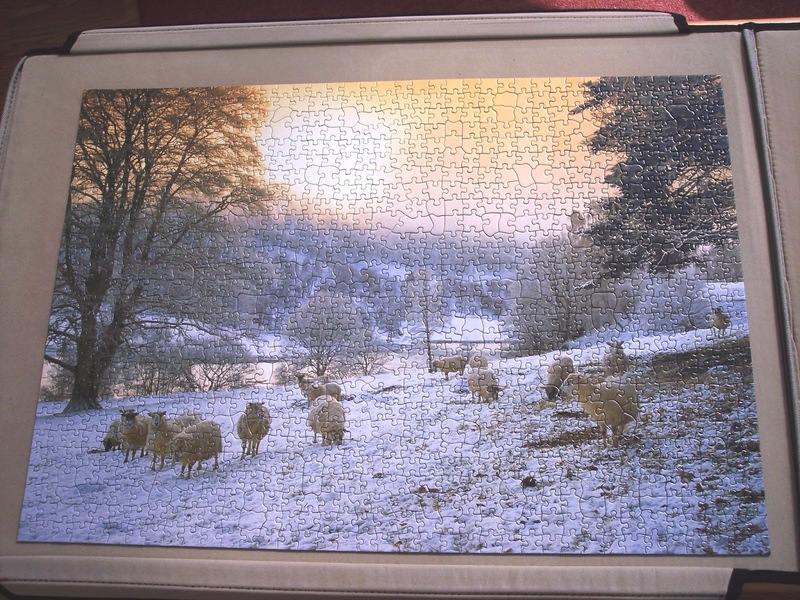 I don't usually struggle too much with puzzles but this one was really hard. 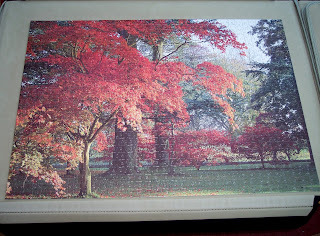 I went wrong numerous times with all those red leaves and couldn't see why. The end result was beautiful though. 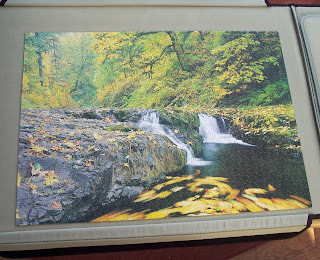 So that's a few of the puzzles I've done recently. To be honest it's part of the reason my reading has dropped off a bit but I'm enjoying them immensely and life's far too short to not do what you fancy in your spare time.